Is it starting to feel like Summer where you are? Thanks so much to everyone who played along in last week's Cute and Girly plus color challenge. We really enjoyed seeing all your entries! Be sure to stop back on Tuesday and see who our random winner is and who has been chosen to be in our Top 3! In honor of our July 4th celebrations in the US this weekend, this week we're asking you to create a card with a celebration theme! It can be a birthday, a wedding (it is the season afterall) or just about celebrating life. 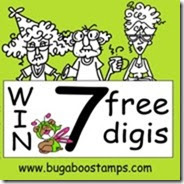 Designed2Delight digital stamps are whimsical and FUN images hand-drawn by Faith Skrdla. Faith’s love of cardmaking and technology inspired her to venture into the world of illustrating digital stamps in November 2009. Each digi is created with the cardmaker in mind, and is a high-quality, high-resolution image you will use again and again. D2D offers a wide range of images—truly something for everyone. If you prefer "real" stamps, you can find Faith's artwork in rubber exclusively for Whipper Snapper Designs. Whimsy Stamps is a family owned business and online store located in the United States. We carry a line of whimsical and fun rubber stamps made from deeply etched red rubber and mounted on EZ mount foam. 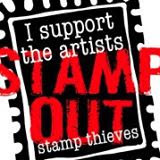 We also have a digital stamp collection with new releases on the 1st of each month. We've recently added an online gallery for our DT and registered users where you can find lots of samples using our stamps. We also have an inspirations blog with daily postings and product info and our featured stamper Saturdays! Here are this weeks amazing inspiration from the design team. There is much eye candy with all these lovely projects and works of art to look at. Thank you for letting me join in the challenge.